Orion Camera Supreme-C 10.5cm f/2.8 lens head no.542029. Picture courtesy of eBayer toolchest. (Image rights). The Supreme (スープリーム or スュープリーム) lenses were made by Orion Seiki, later Orion Camera then Miranda Camera. The Universal Supreme 5cm f/3.5 is only known from an article by Orima Isamu in Kurashikku Kamera Senka. In this document, it appears on a viewfinder-only Chiyoca 35, which was passed to Mr. Orima by Ogihara Akira (荻原彰), founder of Orion. No other example is known, and the lens was perhaps a prototype. The serial number is 510418 — the two first digits might indicate that the lens was designed or produced in 1951 but this is unsure. The lens is probably coupled to the rangefinder but this is not confirmed. The lens owner reports that it has three elements, judging from the number of reflections; this is however strange on a 5cm f/3.5 lens in Leica screw mount, where one would expect a Tessar formula with four elements. The barrel is collapsible and has an all chrome finish. 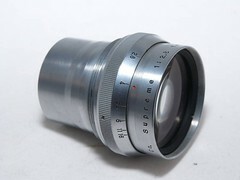 The rear part with the focusing ring is inspired by the Leitz Elmar 5cm f/3.5. Focus is driven by a tab with an infinity lock. The focusing scale is engraved in metres and goes down to 1.25m or closer. The front part is inspired from the Elmar 5cm f/2.8, and has the aperture scale on the side, graduated from 3.5 to 16. The lens has two screw threads for filter or hood attachment: an inner one around the lens bezel and an outer one. The lens bezel is engraved Universal Supreme 1:3.5 f=5cm No.xxxxxx in black on a chrome background. The "Universal" brand is otherwise unknown, and there is no mention of Orion. The Orion Seiki Supreme 3.5cm f/3.5 is very rare too. It has an all chrome rigid barrel. The focus ring has a tab and an infinity lock, and is coupled to the rangefinder. The distance scale is engraved in feet, from ∞ to 3½ft. The front part of the barrel rotates when focusing. The aperture ring, graduated from 3.5 to 16, has two milled ears for gripping. The front rim is engraved Orion Seiki Supreme 1:3.5 f=3.5cm No.xxxxxx. 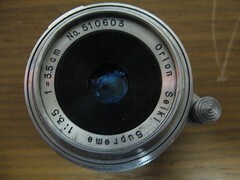 The lens was sold in a dark red jewel box, with an ORION logo stamped at the top. 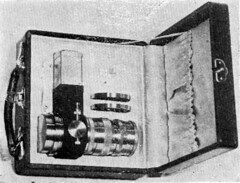 It came with an external viewfinder, for which there is a space in the jewel box; the actual example pictured below has been found with an all chrome cylindrical finder, engraved 35mm at the top, which is certainly original. Orion Seiki Supreme 3.5cm f/3.5 no.510603. Pictures courtesy of St. Vincent de Paul in Bremerton, WA. (Image rights). An isolated example has been observed with a black bezel and white markings; its serial number may be in the 50xxxx range. Other examples have black markings on a chrome bezel; the confirmed serial numbers are 510464 and 510603. On lens no.510603, the aperture scale is repeated on the bottom side. This feature, which is lacking from the earlier examples, was certainly added to make the scale visible from above whatever the focusing distance. The 510xxx numbers are only slightly later than that of the Universal Supreme 5cm f/3.5 — the "51" prefix might indicate the design or production year. The Supreme 10.5cm f/2.8 lens has four elements in four groups. It was made by Orion itself, from an optical design by Mr. Koide (小出), who was working for the company Hokushin Denki (北辰電気) at the time. 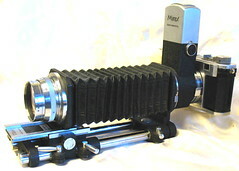 All the versions have a 44mm screw mount, for the Mirax, Focabell and Miranda, differing by the film-to-flange distance. The Supreme 10.5cm f/2.8 was first made with a manual diaphragm, until the release of the Miranda T. The Supreme-A fits the Mirax-A, for Leica screw mount cameras, the Supreme-B fits the Mirax-B, for Contax or Nikon cameras. 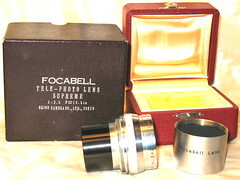 The lens head was sold alone as the Supreme-C, for the Focabell bellows unit. The Supreme-C manual lens head is all chrome, with fine mills on the aperture ring, and has protruding rear elements. The lens name is engraved on the side, around the rim: Orion Camera Co. Supreme 1:2.8 f=10.5cm, and the serial number has six digits. The first two look like they might indicate the year of production, but this is certainly misleading (see Mirax). Supreme-A 10.5cm f/2.8 on a Mirax-A. From Photo Art no.80, June 1955. (Image rights) Supreme-B 10.5cm f/2.8 on a Mirax-B. The Supreme-A and B have an all chrome barrel in a similar finish, with fine mills on the base and focus ring. The distance scale is engraved in feet, down to 5ft. The barrel is inscribed for Mirax–A (or presumably for Mirax–B) in front of the focus ring. 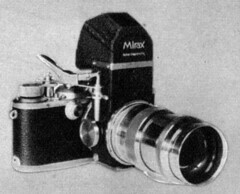 They presumably only differ by the length of the barrel, because the film register of the Mirax-B is longer than that of the Mirax-A, so the Mirax-B focusing mount should be shorter. When detached, the lens head is indistinguishable from the Supreme-C.
Small changes were applied during the production of the manual model. On the early lenses, the aperture ring turns from 2.8 to 16 in the clockwise direction (as seen from the front), and the protrusion at the rear of the lens head is all chrome. Serial numbers are known in the 53xxxx range, from 530208 to 531249. Orion Camera Supreme-C 10.5cm f/2.8 lens head no.530208, alone or mounted on a Mirax-B and Focabell via close-up rings. Pictures courtesy of Igor's Camera Exchange. (Image rights). On intermediate lenses, the aperture ring goes from 2.8 to 22 — in the same direction — and the rear protrusion is black finished, certainly to avoid internal reflections. Serial numbers are confirmed in the 54xxxx and 56xxxx range, from 542018 to 561020. Orion Camera Supreme-C 10.5cm f/2.8 lens head no.542029. Left: with jewel case and rear cap. Right: on a Mirax-B and Focabell outfit. Pictures courtesy of eBayer toolchest (Image rights). Late lenses only differ by the direction of the aperture ring, which is turned counter-clockwise to close the diaphragm. The only confirmed serial numbers are 561056 and 561099. 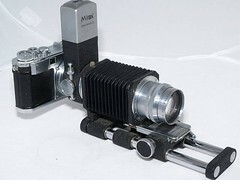 Mirax-A and Supreme-A 10.5cm f/2.8 lens no.510808, on a Leica IIIb. The Supreme-A and B were certainly released at the same time as the Mirax. 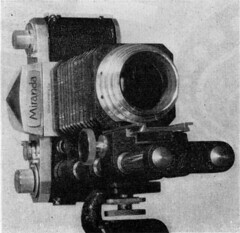 The lens is pictured in the June 1952 issue of Shashin Kōgyō, with an ORION lens cap. The same picture appears on a carbon-copied typewritten sheet issued by Orion Seiki at a very early period, listing the Mirax features. It shows a Supreme-A with serial number 510808; this is the only lens known so far in the 51xxxx range. Brochure for the Mirax, Focabell and Supreme, c.1953 (extract). The above Japanese brochure, dated c.1953, shows the Supreme-A and C, and lists a number of accessories. It gives various catalogue numbers, which are otherwise unheard of. Those for the Supreme-A, B and C 10.5cm f/2.8 are respectively 200A, 200B and 200C. The brochure reproduced below is slightly later (c.1954), and supposedly shows the three versions side by side. Brochure for the Mirax, Focabell and Supreme, c.1954 (extract). The lens head appears for ¥18,700 in an advertisement by Matsushima in Asahi Camera November 1953. 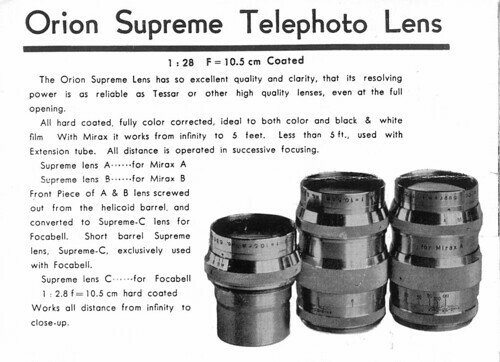 All three lenses are listed in the June 1955 special issue of Photo Art, both in the main text and in the advertisement placed by the distributor Matsushima; the price for the Supreme-A and B is given as ¥25,000, and that of the Supreme-C is ¥18,800. and the June 1955 special issue of Photo Art. (Image rights). The Supreme-A, B and C were sold for some time after the introduction of the Miranda SLR. 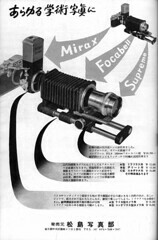 The Supreme-A and B manual lenses are pictured in an advertisement for the Miranda B placed by Miranda Camera in Asahi Camera February 1959, shortly before the products of the company ceased to be distributed in Japan. The picture shows many other Miranda products, including the Mirax, Focabell and Supreme-D preset lens (see below). 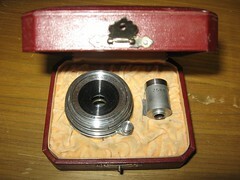 The Supreme-C lens head is also visible in the user manual of the Miranda ST, released in 1960. 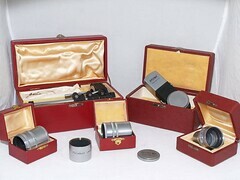 Various lists of interchangeable lenses dated 1959 and 1960 mention the Supreme-A, B and C as having a preset diaphragm, but the 1959 and 1960 pictures make this very unlikely. 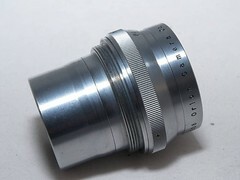 The price at the time was ¥25,000 for the A and B, and ¥18,000 for the lens head. 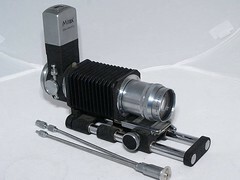 The Supreme-A and B were sold in a red jewel case, inscribed MIRAX–A (or certainly MIRAX–B) and TELEPHOTO LENS SUPREME 1:2.8 F=10.5cm, with the company name ORION CAMERA CO., LTD., TOKYO. 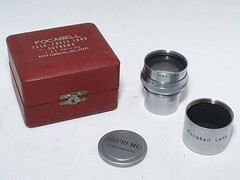 The Supreme-C came in a smaller red jewel case, inscribed FOCABELL TELE–PHOTO LENS SUPREME 1:2.8 F=10.5cm ORION CAMERA CO., LTD., TOKYO, contained in a reddish brown cardboard outer box. All the lenses have an all chrome push-on front cap. Early ones are simply engraved ORION; later ones have SUPREME and Orion Camera Co. markings. 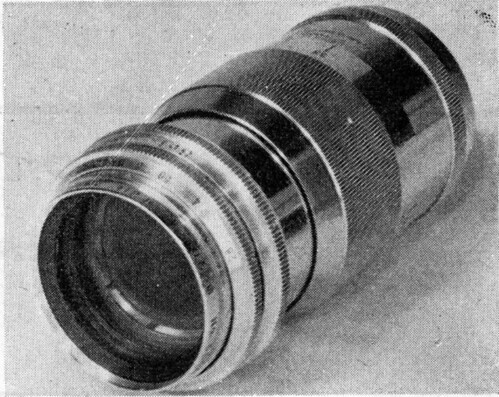 The Supreme-C was supplied with a long rear cap, inscribed Focabell Lens on the side, to protect the protruding rear elements. An adapter was offered as a separate accessory to attach the Supreme-A on the Exakta camera (M-E adapter, #1020). The Supreme-D preset lens was released in 1955 for the Miranda SLR camera. The early version of the Supreme-D looks very similar to the manual Supreme-A and B. It has a bright chrome finish and fine mills on the focus ring, aperture and preset rings and base mount. The head can be detached for use on the Focabell. This version of the lens is only known from two pictures — reproduced on the right — in an article by Ogihara Akira presenting the Miranda T in Shashin Kōgyō September 1955. The regular version of the preset Supreme-D has a different barrel, with knurled sections on the focus ring, aperture and preset rings and base mount. The moving rings have a frosted texture, and the fixed parts are polished. There is a single aperture scale, placed between the aperture and preset rings. The lens sometimes comes in a box inscribed MIRANDA INTERCHANGEABLE LENS. 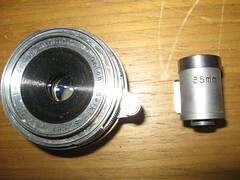 The lens head is detachable, and can be mounted on a Focabell bellows. According to the Miranda T user manual, the head alone is called Supreme-H, but it is unclear if it was sold separately. It is longer than the manual Supreme-C, and perhaps does not have protruding rear elements. The regular version of the preset Supreme-D is pictured in an advertisement reportedly dated 1956, indicating that it was already produced at the time. 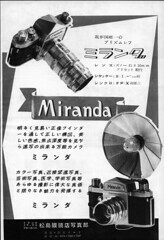 Other advertisements for the Miranda T mention the lens, notably those in Asahi Camera January and May 1957, confirming the price of ¥28,000. 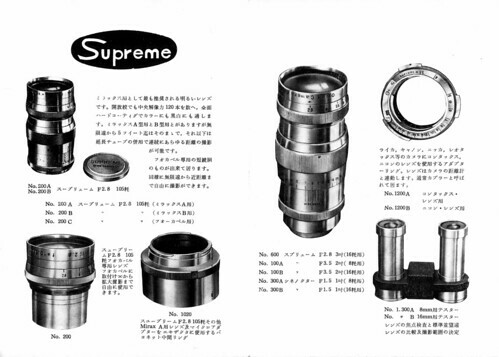 The Supreme-D continues to appear in various lists of interchangeable lenses at least until 1960, and is still pictured in the user manual of the Miranda ST, issued the same year. Various cine lenses are listed in a Japanese brochure dated about 1953 (reproduced above for the 10.5cm f/2.8). The Supreme 3in f/2.8 exists for 16mm cameras only, presumably in C-mount (#600). The barrel has the same finish as that of the Supreme-A 10.5cm f/2.8. The Supreme 2in f/3.5 is offered for 8mm or 16mm cameras — presumably D-mount and C-mount (#100A and 100B). Finally, the Cine Noctar (or "Cine Noktar", シネノクター) 1in f/1.5 is listed for 8mm or 16mm cameras too (#300A and 300B). ↑ The katakana spelling スープリーム is found in all the original advertisements, but the article by Ogihara Akira, p.27 of Shashin Kōgyō no.1, has スュープリーム instead. ↑ Orima, pp.104–6 of Kurashikku Kamera Senka no.24. ↑ The lens was found on a viewfinder-only camera, hence the doubt. ↑ Orima, pp.105 of Kurashikku Kamera Senka no.24. ↑ In the available pictures, the focusing tab perhaps hides the minimum distance. 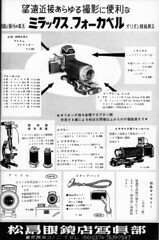 ↑ Lens pictured in Awano, p.124 of Kurashikku Kamera Senka no.32. ↑ Lens no.510464 sold as lot no.397 of Westlicht auction no.14 (see the links below); lens no.510603 observed in an online auction. Lens no.510465 has been reported too, but is unconfirmed. ↑ 8.0 8.1 Table of interchangeable lenses in Shashin Kōgyō Summer 1957, p.109. ↑ Hagiya, p.10 of Kurashikku Kamera Senka no.64. Hokushin Denki was a produced of electric equipment, see the Japanese Wikipedia page on the company. ↑ 10.0 10.1 Ogihara, p.27 of Shashin Kōgyō no.1. ↑ Typewritten sheet Special features of Mirax, c.1952. ↑ Ogihara, pp.275–7 of Shashin Kōgyō May 1953. ↑ Ogihara, p.277 of Shashin Kōgyō May 1953. ↑ 14.0 14.1 14.2 Brochure Mirax & Focabell, Orion Camera's Product's. ↑ 15.0 15.1 Brochure Reflex Box for Copy, Close-up, Micro and Tele-photography: Mirax & Focabell. ↑ June 1955 special issue of Photo Art, advertisement on p.22 and column on p.119. ↑ Advertisement reproduced in Kokusan kamera no rekishi, p.306. ↑ 18.0 18.1 User manual of the Miranda ST.
↑ 19.0 19.1 19.2 Table of interchangeable lenses in Shashin Kōgyō April 1959, p.367. ↑ 20.0 20.1 20.2 Table of interchangeable lenses in Shashin Kōgyō July 1959, p.54. ↑ 21.0 21.1 21.2 Table of interchangeable lenses in Shashin Kōgyō September 1960, p.32. ↑ 22.0 22.1 Ogihara, p.163 of Shashin Kōgyō September 1955. 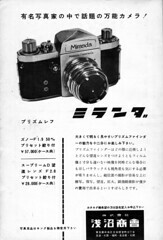 ↑ Example formerly pictured in a page on tele lenses of the Miranda Society Japan. ↑ User manual of the Miranda T, pp.15 and 17. ↑ Table in the October 1955 special issue of Photo Art, pp.66–7. 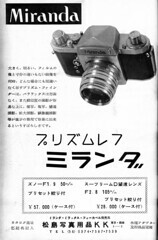 ↑ Advertisements in Asahi Camera January 1957, p.93, and May 1957, p.219. ↑ Table of interchangeable lenses in Shashin Kōgyō May 1958, p.423. Asahi Camera. Advertisement by the photo department of Matsushima in November 1953, p.59. Asahi Camera. Advertisement by Matsushima Shashin-yōhin in January 1957, p.93. Asahi Camera. Advertisement by Asanuma Shōkai in May 1957, p.219. 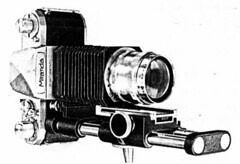 Miranda Camera. User manual of the Miranda ST, c.1960. Ogihara Akira (荻原彰). "Mirakkusu ni tsuite" (ミラックスについて, About the Mirax). In Shashin Kōgyō no.1, June 1952. Pp.26–7. Ogihara Akira (荻原彰). "Mirakkusu no kōzō to tokusei" (ミラックスの構造と特性, Construction and special features of the Mirax). In Shashin Kōgyō no.12, May 1953. Pp.275–7. Ogihara Akira (荻原彰). "Mirakkusu to Fōkaberu ni tsuite" (ミラックスとフォーカベルについて, On the Mirax and Focabell). In Shashin Kōgyō no.24, May 1954. Pp.344–8. Orion Seiki (presumably). Special features of Mirax. Typewritten sheet, English language, c.1952. Orion Camera Co., Ltd. and Summit Camera Co., Ltd. Photography with Mirax. Instruction manual, English language, c.1953. Orion Camera. 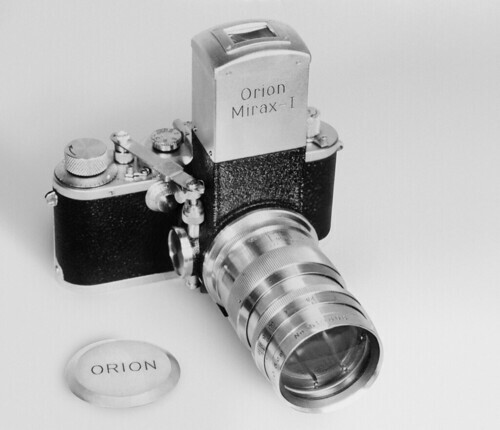 Mirax & Focabell, Orion Camera's Product's. (ミラックスとフォーカベル, Orion Camera's product's.) Brochure in Japanese language, c.1953. Orion Camera. Reflex Box for Copy, Close-up, Micro and Tele-photography: Mirax & Focabell. Brochure in English language, c.1954. Orion Camera Co., Ltd. Miranda. User manual of the Miranda T, c.1955. Reproduced in this Flickr set. Photo Art rinji zōkan: Kamera akusesarī zensho (フォトアート臨時増刊・カメラアクセサリー全書, Photo Art special issue: All the camera accessories). June 1955, no.80 of the magazine. Advertisement by the photo department of Matsushima Megane-ten on p.22. "Shashin no kaimi wa sessha to bōen satsuei kara: Purokusā, Ōtoappu, Refubokkusu, sonota." (写真の快味は接写と望遠撮影から・プロクサー・オートアップ・レフボックス・その他, Because the appeal of photography comes with close-up and telephoto pictures: Proxar, Auto-Up, reflex housing, etc.) Pp.118–20. Photo Art rinji zōkan: Kamera no chishiki (フォトアート臨時増刊・カメラの知識, Photo Art special issue: Knowledge of cameras). October 1955, no.87 of the magazine. "Naigai hyōjun renzu oyobi kōkan renzu ichiranhyō" (内外標準レンズ及び交換レンズ一覧表, Table of Japan and foreign standard and interchangeable lenses). Pp.66–7. Shashin Kōgyō no.26, July 1954. Picture on the front cover. Shashin Kōgyō no.63, Summer 1957. "Nihon no kamera zenbō: Kōkan renzu ichiran" (日本のカメラ全貌・交換レンズ一らん, Compendium of Japanese cameras: Table of interchangeable lenses). Pp.108–9. Shashin Kōgyō no.73, May 1958. "35-miri ichigan-refu yō kōkan renzu to akusesarī" (35ミリ１眼レフ用交換レンズとアクセサリー, Interchangeable lenses and accessories for 35mm SLR cameras). Pp.422–3. Shashin Kōgyō no.84, April 1959. "Kokusan ichigan-refu yō kōkan renzu ichiranhyō" (国産一眼レフ用交換レンズ一覧表, Table of interchangeable lenses for Japanese SLR cameras). P.367. Shashin Kōgyō no.87, July 1959. "Kokusan bōen renzu ichiran-hyō" (国産望遠レンズ一覧表, Table of Japanese tele lenses). P.54. Shashin Kōgyō no.101, September 1960. "35-miri ichigan-refu kamera yō sen'yō kōkan renzu ichiran" (35ミリ一眼レフカメラ用専用交換レンズ一覧, Table of lenses dedicated to SLR cameras). Pp.32–3. Asahi Camera (アサヒカメラ) editorial staff. Shōwa 10–40nen kōkoku ni miru kokusan kamera no rekishi (昭和10–40年広告にみる国産カメラの歴史, Japanese camera history as seen in advertisements, 1935–1965). Tokyo: Asahi Shinbunsha, 1994. ISBN 4-02-330312-7. Advertisement for item 1676. Hagiya Takeshi (萩谷剛). "Miranda Sutōrī" (ミランダ・ストーリー, Miranda story). In Kamera Rebyū: Kurashikku Kamera Senka (カメラレビュー クラシックカメラ専科) / Camera Review: All about Historical Cameras no.64, June 2002. ISBN 4-257-13048-2. Miranda no keifu (ミランダの系譜, Miranda genealogy). Pp.9–12. Kamera Rebyū: Kurashikku Kamera Senka (カメラレビュー クラシックカメラ専科) / Camera Review: All about Historical Cameras no.64, June 2002. ISBN 4-257-13048-2. Miranda no keifu (ミランダの系譜, Miranda genealogy). "Miranda Akusesarī" (ミランダ・アクセサリー, Miranda accessories). Pp.44–5. This page was last edited on 26 April 2019, at 05:24.